Eric and I found a lilac bush and a house to go with it. It was 1981 and we needed to move. For the past five years we’d moved around New England as Eric built his career in food service management. I didn’t care where I lived, as long as I was with Eric. I was a poet, I could write anywhere. The shifting landscape of Eric’s work had landed us in New Hampshire two years before. We rented a house and got married in the backyard. Adrienne was born in our bedroom. We settled in. But after a year the couple who owned the house needed it for her parents. We wanted to stay in New Hampshire, Eric had a good job, it was time to stop moving. We began looking at houses to buy. Eric fell in love with the lilac bush by the front door of the house we bought, the only house we ever owned. When we first saw the house it was a mess. Old, wide-reveal aluminum siding left smudges of white on your skin or clothes if you rubbed up against it, metal gleaming through in patches like a bald skull under thin hair. The rows of windows on the porch running along the south and west sides of the house had peeled to bare, raw wood, the glass barely held in place by dried caulking that flaked off in chunks. There had been a grease fire in the kitchen the year before and black soot still crawled up the walls to the ceiling, an echo of the flames. An old corner room had been turned into a bathroom, a toilet and free-standing sink and tub spread across the space. It was an upgrade from the two seater outhouse in a corner of the barn. But the massive lilac bush was in full bloom by the front door and the air was sweet with scent. We stepped over the threshold into the living room and looked at each other. “This is it,” we said to each other with our eyes. In the week after Eric died, the lilac blossoms burst open and I sat on the porch, next to the bush, and wrote and listened and watched. The world was all new again, focused around absence. A catbird I wanted to believe was speaking to me for Eric sat on the wires crossing through the crown of blossoms, and sang over and over. The songs varied in pitch and melody, as if the bird was trying out for parts as other birds, other beings. A pair of sparrows was nesting in the yew hedge on the other side of the porch, and when the catbird wasn’t singing I listened to the chicks squawking as the parents brought them food. Birds became my porch companions. They occupied my grief and gave me a new language, one I didn’t have to write down or try to remember. The passage above is from the The Island Journal, the first iteration of the memoir I recently completed — a book I intended to write only on islands, in a handmade journal David gave me in the first months we knew each other. There are many reasons there are very few traces of that original Island Journal in the finished draft of the memoir (the primary reason being that people who read it couldn’t figure out what was going on), but there are so many memories packed into that journal that come to me at different times. Like right now when the lilac bush is coming into peak bloom. 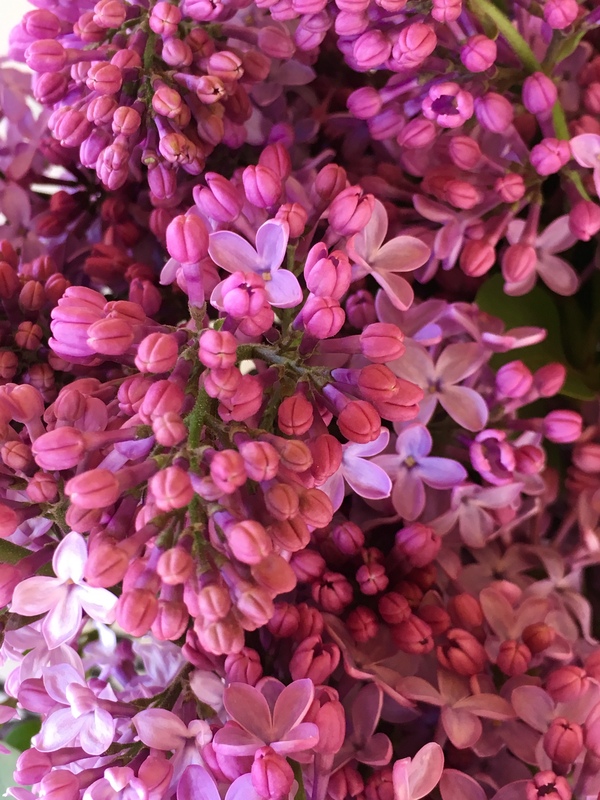 I still live in that same house, the lilacs still make me think of Eric, and I still bring a bouquet to Eric’s grave every year. I’ll bring one tomorrow.